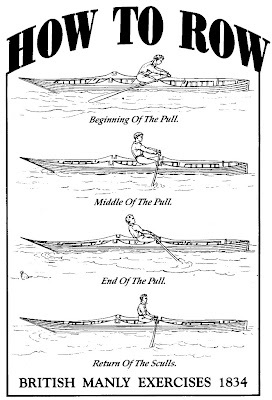 Gavin Atkin at intheboatshed.net has a wonderful discovery - a 'how to row' poster from a series called British Manly Exercises 1834. Presumably this was followed by a series on ballet called Foreign Effeminate Exercises 1835. Is that a bottle floating in the water at the end of the pull? Tsk tsk. Anyway, the poster is on Wikipedia so you can print it out and hang it on your wall.